Travel with Chopin. Not only will you visit Warsaw and Mazovia, but also a relatively unknown but intriguing old hunting lodge for a themed party. Make a toast to Fryderyk Chopin in the place where he composed his Opus nr. 3. Any day is good for celebrating Chopin’s birthday, not only because it’s uncertain whether he was born on March 1. 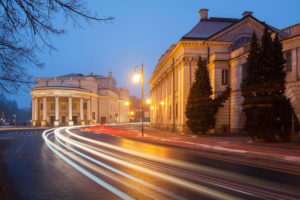 This tour is recommended to groups of people or individual clients who want to combine a visit to Warsaw with an unusual enjoyable experience deep in the heart of Poland. Transfer form the airport to your hotel in Warsaw. Welcome dinner in a traditional Polish restaurant, serving outstanding Polish cuisine. Our guide will take on a tour of Warsaw. Chopin’s first 20 years were spent in Warsaw. It was his expressed wish that his heart was returned to Warsaw. After Fryderyk’s death his sister Ludwika brought his heart, reportedly immersed in French cognac, to Warsaw and since then it rests in the Holy Cross Church. 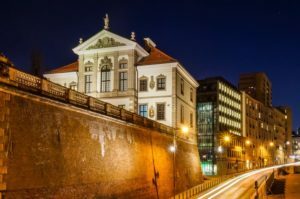 During this tour we will show you all the places where Chopin’s Family lived as well as the other highlights of Warsaw: the Old Town, the Royal Castle, the Royal Route, Warsaw’s Lazienki Royal Gardens and especially interactive Chopin’s Museum. In the evening, you attend a Chopin Piano Concert. Our best pianists will make this evening unforgetable. Departure to Zelazowa Wola where Chopin’s parents met and where Fryderyk was born in 1810. A few months after his birth the family moved to Warsaw, but this small, beautiful mansion is the most important place to pay homage to Chopin. After visiting Zelazowa Wola you will be taken to Brochow. An old parish church located here is the place where Chopin’s parents got married and where young Fryderyk was baptised. From Brochow you will drive directly to the Antonin hunting lodge. Antonin is located in the southern part of the Greater Poland province. Fryderyk Chopin received an invitation from Duke Radziwill to visit Antonin in the autumn of 1829. He spent a memorable week there, and composed his Opus 3. for piano and violoncello. I received your last letter, in which you bade me kiss myself, at the Radziwiłł’s residence in Antonin. I was there for a week, and you’ll not believe how well I felt there. […]. As for my own person and passing amusement, I would have stayed there until I was chased away, but my affairs, and my Concerto in particular, not yet finished, and impatiently awaiting the completion of its finale, compelled me to leave that paradise. There were two Eves there, the duke’s young daughters, extremely good and polite, musical, tender creatures. 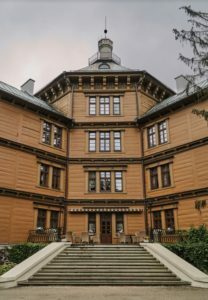 In the evening you attend a piano concert organised in the hunting palace followed by a gala dinner and small party to mark the occasion of Chopin’s birth in Poland – where else than in the lodge that has hardly changed since Chopin’s times (subject to availability). Overnight in Antonin – historical 3-star hotel on the hunting lodge premises – or vincinity. Late breakfast in the hotel. Departure for Warsaw. On the way, we take a short “health” break in Kalisz. Fryderyk visited Kalisz several times but usually only for the couple of hours when he was passing by. However at the beginning of November 1829, when he was returning from Antonin he was able to dwell for a day. On the way back I was in Kalisz at a soirée with Mrs Łączyńska and Miss Biernacka. She pulled me up to dance, I had to dance a mazur, and that with an even lovelier maid than she, or at least equally as beautiful. […] I was in Kalisz only one day. During your walking tour of Kalisz, the oldest town in Poland (mentioned in Claudius Ptolemy’s Geographia in the 2nd century AD), we will show you the the cozy historical centre as well as the partially reconstructed mediaeval Polish town in Zawodzie. You will also have an occassion to taste the local waffles called “andruty”. Optional: Additional night in Warsaw. Another overnight in Antonin: then e.g. a visit to the beautiful Goluchow Château (similar to the palaces in the Loire Valley), close to Kalisz. Visit to the staggering pilgrimage complex in Lichen Stary (the 6th largest church in the world, a very unusual experience) or an evening party in post-industrial Lodz, the third most populous Polish city. This tour can be taken only by organised groups (both self-organised or via travel business partners). It comes recommended as an integration event or a trip with a group of friends. We can modify the tour programme / services to suit your preferences so that it can be attractive also for individual travellers.